In order to fully eradicate Japanese Knotweed present on a housing development site in Sheffield, VertaseFLI undertook the selective excavation of Knotweed contaminated soils. Japanese Knotweed is a highly invasive, aggressive species of plant. 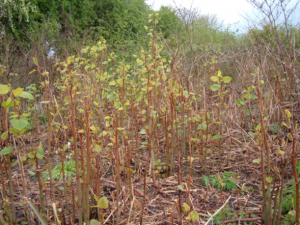 Particular problems associated with Japanese Knotweed are its ability to tolerate a wide range of soil conditions and its ability to regenerate from very small amounts of tissue. Under the Wildlife and Countryside Act 1981, it is an offence to spread Japanese Knotweed. All parts of the plant are considered waste under the Hazardous Waste Regulations – therefore must be disposed of at a licensed landfill and not reused in construction or landscaping. Knotweed can cause damage to paving and tarmac areas, a reduction in land value and is aesthetically displeasing. Site clearance of fly tipped materials. Removal and disposal off site of Japanese Knotweed contaminated soils. Removal off site of excess inert materials. Cut and fill re-profiling earthworks.